Last Monday, Runner's World began their #RWRunStreak Challenge. The challenge is to run at least one mile a day for 40 consecutive days—Memorial Day through Independence Day. I was a bit unclear as to how the challenge worked from the standpoint of getting the miles logged, so unfortunately, I didn't get my Monday run logged in on time to count towards the streakerboard. However, I'm attempting the streak for fun and to motivate myself, so I still count it :) The problem was I have never used Map My Fitness (or Map My Run) before—I had downloaded it on my phone and created an account, but didn't really see a use for it, since I have always used a Nike watch or app—and manual entries aren't allowed, since some people have misused that option in the past. I didn't link my Nike+ account with Map My Fitness and import my run until Tuesday, so it didn't count. Oh well. On their page describing the challenge, they note that: The streakerboard is sorted by mileage, but that doesn't mean that you should go out and try to run as many miles as you can each day. The main point of this challenge is to support healthy, sustainable running habits. They also mention on their Facebook Page: If you've been having difficulty logging miles with MapMyRun, feel free to use this forum thread as a way to "check in" each day with your mileage. However, please keep in mind that recording your runs there (or on MapMyRun) is not required to be considered part of the #RWRunStreak. All you need to do is run at least a mile day. This challenge is intended to be a fun way to promote healthy running habits. It's not a competition. 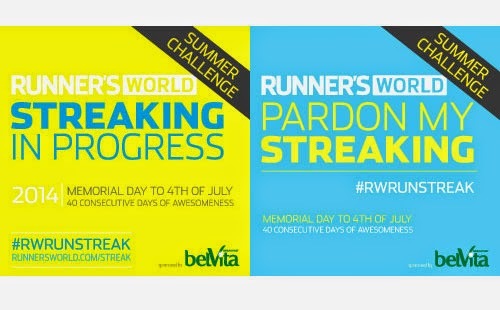 Head on over to the Runner's World #RWRunStreak page for more details. You can also 'like' them on Facebook to get updates and find out what other runners participating have to say, or follow the hashtag (#RWRunStreak) on Twitter and/or Instagram—don't forget to share your own progress and help motivate other streakers! Have you joined the challenge? Ever gone 'streaking' before? Thoughts on such challenges?